The W3 Winners have been announced and CreateYourOwnVille.com won a Silver! As Senior Interactive Producer for the CreateYourOwnVille.com campaign, I was responsible for creating the initial campaign concepts, determining the interactive elements, drafting the initial sitemap and budgeting the entire campaign. Additionally I was involved in the creative phone brainstorming sessions between our matrixx team and Johnsonville. The W³ is sanctioned and judged by the International Academy of the Visual Arts, an invitation-only body consisting of top-tier professionals from a “Who’s Who” of acclaimed media, interactive, advertising, and marketing firms. IAVA members include executives from organizations such as Alloy, BRANDWEEK, Coach, The Ellen Degeneres Show, Estee Lauder, HBO, iNDELIBLE, Monster.com, MTV, Omnicom, Polo Ralph Lauren, Refinery, Sotheby’s Institute of Art, Victoria’s Secret, Wired, Yahoo!, and many others. For more info, and a full member roster, please visit www.iavisarts.org. 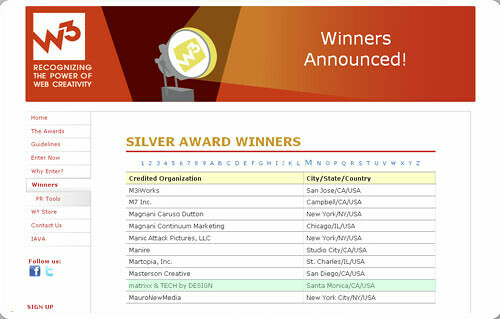 The whole team was entered (Johnsonville, Tech by Design and matrixx) for this year’s W3 awards … and won!! With almost 3,000 entries from all over the world, we are very proud to join such rare and talented company! There were some really awesome winners this year in the categories including campaigns for Gillette & EA Sports – http://www.getaloadofthis.ca/2009/gillettetournament/w3/iebc/, 2010 Ford Mustang – http://focus.firstbornmultimedia.com/?ford_2010_mustang, and many others. Two Best In Show in Food & Beverage were awarded – both for Coca Cola for http://www.sapient.com/awards/integrated-campaign.html and for www.livepositively.com. Other Food & Beverage Gold went to popular brands such as Kraft, Subway, Coca-Cola Coke Zero, Red Bull, Hershey’s Twizzlers, Pepsi Amp Energy Drink, McDonald’s and Jim Beam.